Do you know the best way to secure funding for your company? Whether you work for a private or public company, large or small, and whether you are concerned with a specific asset project or a larger corporate transformation, you may need long- or shorter-term finance. This has been hard to come by of late for any fossil fuel exploration and production activity. Conversely there are bargains to be had in the sector if you can raise that vital finance. Many companies are now working across the energy or natural resources spectrum to broaden their portfolio and, likewise, investment funds and advisory firms can cover this range. A few majors and relatively debt free contractors are able to finance their own projects. Many companies have had a couple of years since the 2014 oil price crash to restructure their debts one way or another. But since the oil price seems to be staying lower for longer it is becoming harder to convince investors currently why they should choose your project over the many others they may be offered. Firstly, you need to choose your project wisely. Where is your best market which will provide for future growth? A compelling profitable case is needed. Equally, have you been cautious? 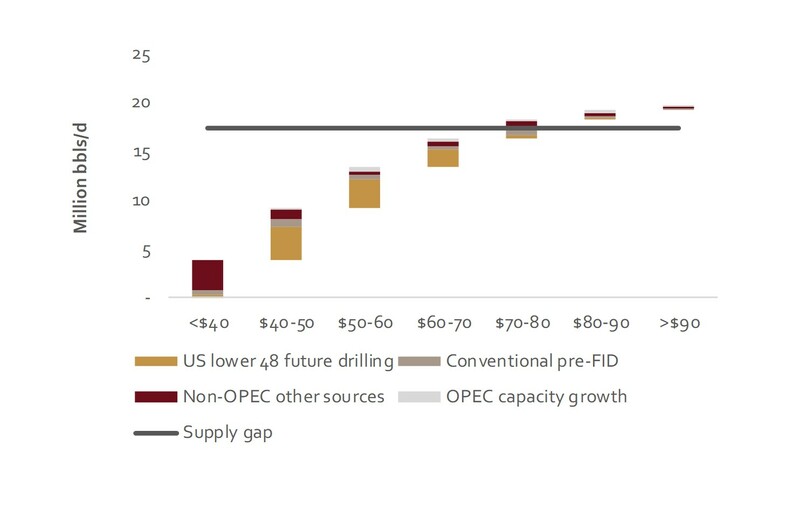 Have you correctly assessed your P90 case and does it work below an oil price of $60 a barrel? Have you, as a company, got a well-balanced portfolio, with oil and gas, across the value chain, and geographically spread across various political regions? Finally, are you planning to be fully aligned with your investors, sharing the risks and waiting for those profits? Figure 1: Private equity funding in the North Sea. (Source: Woodmackenzie) You may be able to tap vendor finance or, in other words, raise investment, perhaps as work, from your contractors. For example, Transocean Rigs recently did an incentivised deal with Hurricane Energy – but investment for Hurricane Energy’s development also came from Kerogen Capital, a private equity fund, as well as other institutional investors. Private equity funds appear to have billions to invest but can afford to be choosy. They say they are prepared to invest in long-term projects but require transparent information sharing and updates along the way from aligned and experienced managements. Over the past year, the North Sea, for example, has experienced a large increase in private equity funding and spending (Figure 1). Figure 2: UK North Sea M&A. (Source: Company reports, I.H.S Herold) A company that looks fundable in the future may tend towards a gas portfolio focus rather than one focused on oil; the acquisition deal that private energy backed Neptune Oil and Gas chose to make with French utility Engie’s E&P business is one such example. An onshore location for your portfolio may provide the lower project costs that again make an investment look more appealing. Working up a project along the value chain and then farming down your equity also raises money effectively. For funding you may need to consider a corporate transaction; a strategic transformation may be needed as part of the preparation for raising funds from the capital markets, public and private. The UK North Sea has seen a significant increase in M&A (mergers and acquisitions) activity in 2017 after several years of downturn (Figure 2). Figure 3: Equity raised in London for E&P companies. (Source: London Stock Exchange). The equity markets remain relatively subdued outside of a few large raises. Excluding Tullow Oil’s approximately £600 million rights issue and Hurricane Energy’s £235 million follow-on, only about £285m has been raised in London in 2017. The IPO (the initial offering of a private company to the public) market remains particularly depressed, with the last IPO over £50 million in the industry being Seplat Petroleum’s in 2014 (Figure 3). As the RBL (reserve based lending) market has also remained subdued, commodity traders have increased lending to the sector in order to gain access to offtake. This lending can be structured in various ways, including providing prepays and buying Asian call options. A recent example is Mercuria Energy Trading’s $75m prepay arrangement with TransGlobe Energy, who will use the money to refinance and restructure and which will be paid back through deliveries of oil to Mercuria. Figure 4: Supply gap to 2025. (Source: Woodmackenzie). If you are not a listed company, you might wish to consider listing via an IPO, but only if your project or portfolio looks compelling. You will also need commercial and legal advice and good marketing material. You will have to consider where you list; perhaps the London Stock Exchange has the best track record and initially you might consider the smaller friendlier AIM market there, but there are alternatives around the world with some experience of E&P companies that might suit your project better. Whatever your route, you are also likely to need good technical advisers and an independent Competent Person’s Report on the volumes, merits and risks associated with your project or across your portfolio. This report can then be quoted in your marketing material. Happy Ending? Only If We Increase Our Collaborative Efforts! Figure 5: New supply required to fill the gap. 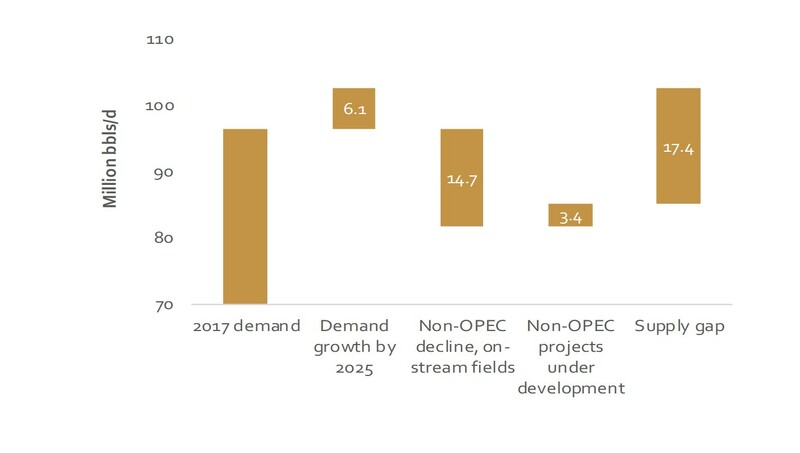 If there is no increase in the funding available for new oil and gas exploration and developments then many observers predict a shortage of production versus demand in the mid-term future, even when an increasing market share for alternative energies is included in the model. The much-acclaimed industry cost-cutting which has been so prevalent over the last few years has included a lack of investment at the start of the value chain (Figures 4 and 5). The collapse in oil prices has led to a major short-term drop in investment in the oil industry, with global investment in production and exploration falling from $700 billion in 2014 to $550 billion in 2015, with spill-over to energy commodities. Sharp declines in investment in other commodity sectors have also contributed to overall slow global growth. An increase in funding for worthy E&P projects is therefore a beneficial aim for all of us in 2018. After discoveries in Mozambique, Tanzania and Uganda, Kenya hopes to join the club.